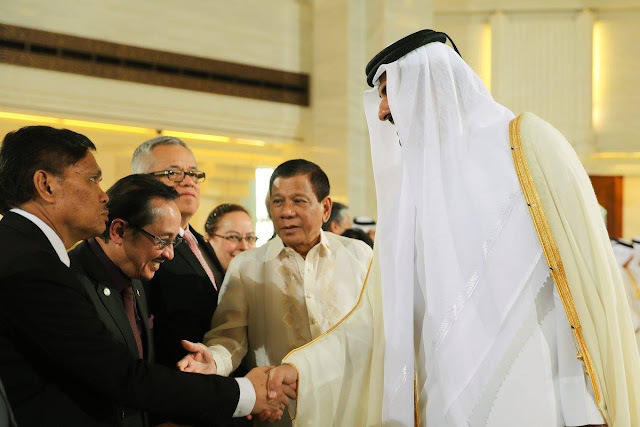 President Rody Duterte receives a warm reception from His Royal Majesty King Hamad Bin Isa Al Khalifa during the welcome ceremony at the Sakhir Palace in the Kingdom of Bahrain on April 13, 2017. 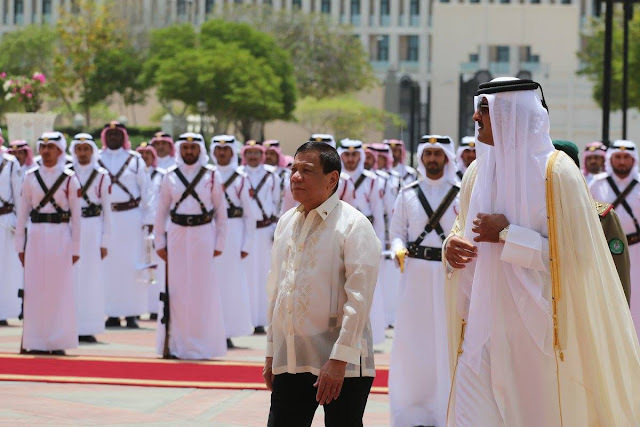 MANAMA, Bahrain, April 13 (PNA) -- A Philippine Embassy official here has expressed confidence that the relationship between the Philippines and the Kingdom of Bahrain will be elevated to greater heights with the upcoming state visit of President Rodrigo Duterte. Philippine Ambassador to Bahrain Alfonso Ver said five agreements are expected to be signed, which aims to expand relations and promote deeper cooperation with Manama. “Yes, we’ve lined up five agreements. First is the establishment of the High Joint Commission, which will be the forum and the mechanism where the entire range of our relationships and other relationships between Bahrain and the Philippines will be discussed. We have an amendment to our double taxation agreement. We have another amendment to our air services agreement. We have a Memorandum of Understanding between the Foreign Service Institute of the Philippines and the Diplomatic Institute of the Bahrain Foreign Ministry. In addition to that, there’s a private agreement, business investment agreement between a company in Bahrain and a company in the Philippines,” Ver said. President Duterte is expected to arrive here on Wednesday night coming from his state visit to the Kingdom of Saudi Arabia. Ver said since the establishment of relations between Bahrain and the Philippines in 1978, the two countries have been striving hard to elevate ties in terms of trade and investment, economic, and employment. "This (trip) will also signal the renewal of our already close ties with Bahrain and hopefully establish even elevated to greater heights especially now as we would like to position the Philippines as Bahrain and the regions gateway to ASEAN and Asia. 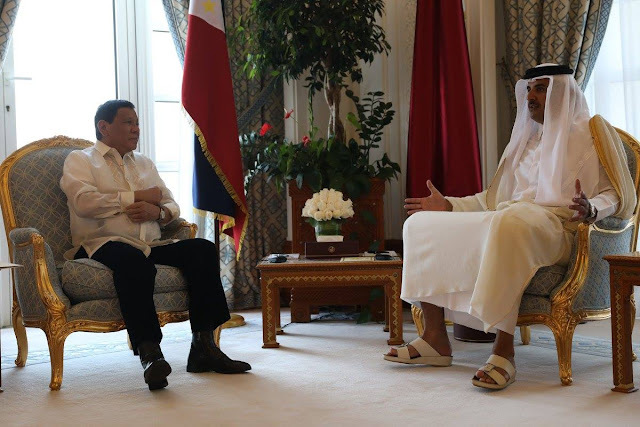 At the same time, Bahrain as a gateway for Philippines into Eastern province of Saudi Arabia, Saudi Arabia and the greater GCC (Gulf Cooperation Council),” he said. President Duterte is scheduled to hold bilateral meeting with His Majesty King Hamad bin Isa Al Khalifa at Sakhir Palace on Thursday. He is also slated to meet with the Capital Club of Bahrain, a prestigious private business and social club composed of top CEOs and businessmen in Bahrain. “They will listen to a presentation from our economic team on possible investments, mutual opportunities for economic exchanges, trade and investment, even tourism and the President will grace that event and hopefully meet also the eminent businessmen here in Bahrain,” said Ver. The President will also meet with the Filipino community at the Khalifa Sports Stadium where thousands of overseas Filipino workers are expected to attend. Ver said there are around 60,000 Filipinos working and living in Bahrain. He said while there are reported cases of abuses against Filipino workers here, the numbers remain low and most workers are treated very well. 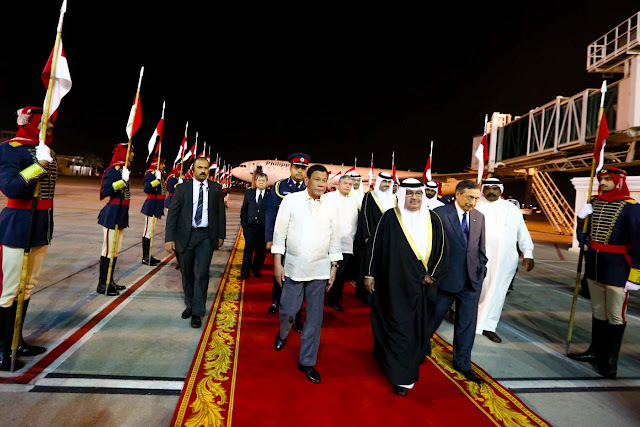 "They are just so anxious and excited to hear direct from him his programs, his plans for the workers here, for their welfare, for their protection, and of course, what they look forward to in the Philippines under his administration,” he said noting that this will be first visit of a Filipino leader in Bahrain after eight long years.‘Duterte is doing a good job’In an interview with several members of the Filipino community here, they expressed optimism and support for the ten-month old administration of Duterte. "I am so happy that he is elected as the President of the Philippines and I’m so proud of him, of what he is doing right now,” said Felma Taylor, a Filipino entrepreneur in Bahrain. "That is a very broad topic if you will talk about corruption. So I think he is doing a good job for that. And the politics, I am not really good in talking about politics but I’m proud of what he is doing,” she added. Overseas Filipino workers Rowena Mariano Al Musawi and Cristalyn Pastrana also lauded the President for the reforms he has implemented particularly his crack down on red tape that led to the improvement of processing of documents in the Immigration. Leslie Arlen Garduque, who owns an advertising company in Manama, also commended the President for being a humble and compassionate leader.